Earlier today I was riding the TTC's Bloor-Danforth subway line from Victoria Park to Bathurst when I saw this guy lying down on three seats and putting his suitcase on two other seats. As if hogging FIVE seats wasn't bad enough, the three seats he was lying across were the blue seats reserved for the elderly, handicapped, and pregnant women. ...and if you dare to say anything to him about it you'll probably be banned from all TTC vehicles for committing "harassment" and "verbal abuse". Hasn't it been like wicked hot? Look at how he's dressed?! Maybe a passed out. The train looked empty anyway and I've seen far worse on the GO with people and their travel pillows, etc. 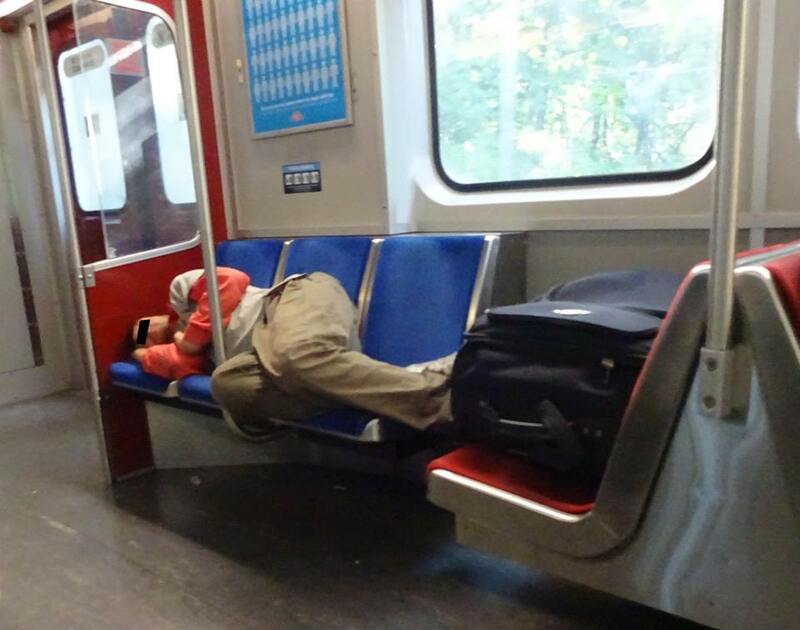 I was recently asked by a guy on the GO train who was very clearly hung over to move from the bench seats by the door so that he could lie down. Needless to say, that didn't go well. Happily (for me) he exited the vicinity shortly afterward to throw up. On London Underground, there are arm rests between each seat. These are not primarily for the benefit of seated passengers, but for the prevention of this.